Charge of the “LIGHT” Brigade……………………. China has her Terracotta warriors, I have my beeswax candles. 🙂 There is something common between them. They are a gift from Mother Earth. Sharing with the farmers on the values of by-products from honey, they are able to have another source of income. Previously, the methods the farmers used to extract honey were to squeeze it from the combs with their bare hands, or separating the honey from the wax by boiling the honey at a high temperature. This process will destroy the quality of the honey. After which, they throw the wax away. With proper education and sensitization, their lives changed. They now know the importance of proper handling of their harvest. Not only they can raise the quality for the honey, they found a new source of income and a ready market. 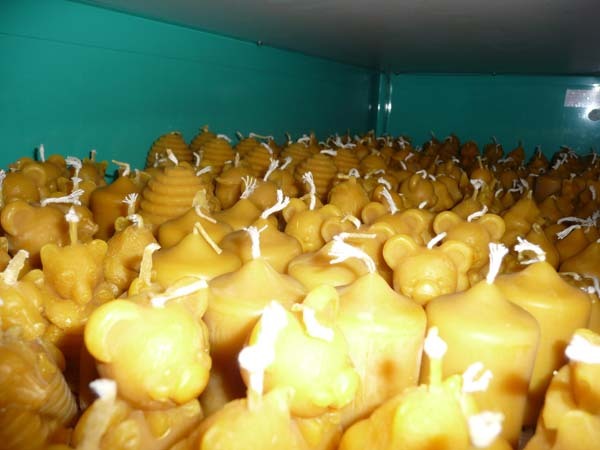 My beeswax candle warriors ready for market.